Do you notice that Santa is not looking up at the camera. It's because Max has a firm hold of his beard. The minute I sat him on Santa's lap, He went right for the beard. All that big, bushy, curly goodness. Whats not to love? Santa couldn't look up for fear that he might be exposed. That would be really awkward. As there were other kids in line to sit on Santa's lap. I had to pry Max's fingers from the beard when I went to pick him up. Being careful not to pull the beard off myself. That would be embarrassing. 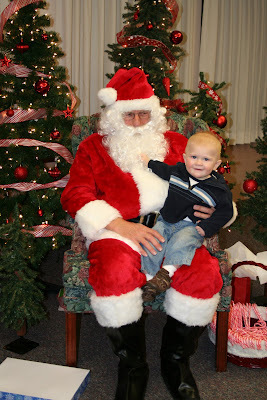 Max was really cute with Santa. I think Santa appreciated it. He said in a really loud tone, Probably so the rest of the kids in line could hear, "This is a REALLY good boy." Nothing guarantees you'll get a lot of loot like pulling on Santa's beard!